Sport > World > Lists > Fittest Sport > Decathlon? "You, sir, are the World's Greatest Athlete" King Gustav V of Sweden to Jim Thorpe after he won the decathlon at the 1912 Olympics in Stockholm. Let's face it, when it comes to any form of sporting event, in order to compete an individual needs to possess decent physical fitness and levels of strength and endurance. Sports of any kind are physically demanding, but when you start competing competitively, that's when things really step up a gear. As far as all around athleticism is concerned, you'd be extremely hard-pressed to come up with a better example of a fantastic all around athlete than the decathlete. Decathletes take part in a number of different events, and for that reason their training has to vary greatly session by session. But are decathletes really the best athletes in the world, and how do they shape up against other athletes such as boxers for example? Let's take a look shall we. First off, what exactly does a decathlon consist of? Between each event there is usually a 30 minute interval to allow the athletes to warm up, prepare themselves etc. How do decathletes shape up against other athletes? So, now that we know that decathletes have to take part in 10 different events over a two day period, we also know what these events are, and can obviously see that there is quite a deal of variety there. Decathletes obviously need to be incredibly fit as their stamina and endurance levels will be tested in the track based running events. They need to be agile and flexible for the long jumps, high jumps etc, and they need to be coordinated and physically strong to compete in the throwing events. For this reason decathletes follow incredibly intense training regimes that incorporate physical fitness, endurance, flexibility, stamina, strength, agility, and coordination. Take boxers for example. Taking absolutely nothing away from boxers, they train incredibly hard, but the main difference is that they're training with one goal in mind, to be the best boxer they can be. Each element of their training is based solely upon the fact that it will help them become a better boxer. The weights they lift, the drills they perform, the cardio they perform. All of that is designed to make them a fantastic boxer. The same goes for other athletes. Having one sport or event to train for means they can concentrate all of their efforts on one event and one goal. Whereas a boxer has one sport to train for, decathletes have 10, and each element of their training has to not only ensure that it helps them with each event, they also need to ensure that it won't hinder other events. Take shot put or discus for example: Generally many shot putters and discus throwers are quite large and muscular, which helps them generate more throwing power. 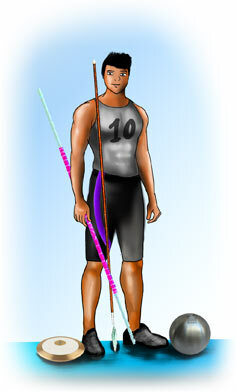 Decathletes however, can't become too big because the added size will slow them down in other events. The training regime of a decathlete is extremely physically demanding and for that reason many people do indeed consider decathletes to be the best all around athletes in the world. Roman Šebrle - a decathlete from the Czech Republic was determined to be the world's greatest male athlete in 2008 according to a panel of sports scientists at The Wall Street Journal. profile of Jim Thorpe - track and field / American football player. vote now, POLL: What do you think is the world's fittest sport?